All eyes within the fashion faction may currently be on the catwalks for the bi-annual look of luxe that is New York Fashion Week, but the charitable work of shoe blogger-turned-author Felicia Coley has caught our fancy. Using her book, How To Stylishly Fall From Grace, as a platform, Coley takes strides to give “heeling” power to women affected by domestic violence. The self-published tome is a fictional memoir about a fashion-forward, independent woman who is swept off her feet (or so she thinks) by a man she meets at a Broadway play—until she relocates her life, wardrobe and shoes to New York City to live with him. With a storyline that has a Cinderella twist, Coley hopes women will walk away with the message of self-worth, especially when in reality up to 70% of women may be abused (a multi-layered definition that goes beyond physical) in their lifetime. Recently appearing at the First Annual Atlanta Black Book Expo, Coley rewarded substance with style, contributing a portion of every book sale to benefit Say No to Violence (an initiative of the Women’s Fund of the UN), and giving back to purchasers the opportunity to win a pair of custom Lauren Luna stilettos for the occasion. The philanthropic fashionista and founder of The Well-Heeled Society lifestyle blog talks to BlackGivesBack about why giving never goes out of style. Read on to learn more about our latest Insider. What role does "giving back" play in your life? Giving back is the selfless way to honor your purpose. Even when you don't think you “have,” a kind word or smile can make a difference in someone's day—or life. My happiest moment of giving back was years ago. As an outside sales rep in Richmond, Virginia, I was barely making ends meet. When I began volunteering at a shelter to serve meals to the homeless, I overheard the staff say they needed a new refrigerator. Knowing I wasn't in a position to help financially, I put on my creative hat and organized the "Ultimate in BlackMale" Bachelor Auction. I was able to get the tuxedos, floral arrangements and food as donations. It was a joy when I presented the check to the shelter. Is there someone in your life who has influenced you or served as your “charitable style” icon? My grandmother has always been my inspiration. She had the most gentle grace. She always made anyone who needed a hand to hold/mouth to feed or shoulder to lean on welcome across her threshold. Since her passing in 1990, I've been on a personal quest to live up to her legacy. What are the most important lessons you've learned in choosing an altruistic lifestyle? "To whom much is given, much is expected." As my Richmond experience shows, wealth isn't limited to one's bank account. Time, talent and sincerity have just as much value. If you could give $1 million to any type of nonprofit organization or charitable initiative so they could “accessorize,” who would it be? Without a doubt, UNIFEM (http://www.unifem.org)/ would be my $1 million beneficiary. Since 2008, I have been an avid supporter of bringing a voice to women affected by domestic violence. From coworkers to family, I've witnessed too many women devalued. We are queens and need to be treated as such! That's why I strive to give "heeling power" with every copy of my book sold. There is nothing pretty about violence against women. What's next for you and your book? I'm elated that my recent involvement in the First Annual Atlanta Black Book Expo resulted in book clubs choosing How to Stylishly Fall From Grace to read! My goal for the book is to address colleges, starting at HBCU campuses. The death of University of Virginia student Yeardley Love last spring is a grim reminder that date violence is growing within the age group of 20-somethings. Do you have a word in season for young, gifted and Black professionals as it relates to giving? No matter what you are going through in your personal life, do know there is someone, somewhere that is going through times twice as hard who would love to stand in your shoes. Just by reaching back and helping them (or someone else), you'll be amazed at how blessed you really are. October is Domestic Violence Awareness Month. If you would like Felicia Coley to address your group or participate in your observance and awareness-raising activities, contact her at stylishlyfall@yahoo.com. 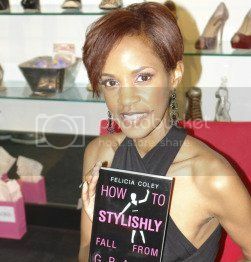 For more details regarding her book, visit HERE. 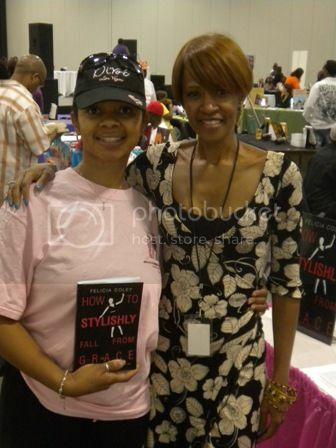 Photos: (Top) Author Felicia Coley and (Bottom) Coley (right) with Vegletta E. Lewis, Atlanta Black Book Expo attendee and winner of the custom heels from Lauren Luna. Thank you for giving me sunshine thru new shooz! Bless you dearly.